SAN DIEGO – On Friday morning, right as this year’s group of 52 Perfect Game All-Americans were finishing breakfast inside of one of the large meeting rooms at the Marriott Mission Valley Hotel and preparing to board a bus that would take them to Rady Children’s Hospital, All-American Garrett Mitchell pulled up a chair at an outdoor table overlooking the hotel’s swimming pool. A very soon-to-be-senior at Orange Lutheran High School who calls Anaheim, Calif., home, Mitchell certainly looks the part of a PG All-American. An athletic 6-foot-2, 200-pound left-handed swinging and right-handed throwing outfielder, Mitchell speaks easily and confidently, and the anticipation he felt leading up to the Rady visit was evident in his voice. Proceeds from the Perfect Game All-American Classic have been directed toward Rady and pediatric cancer research and patient care for more than a decade now. For the past three years, the All-Americans themselves have taken on their own fund-raising efforts, and as of Friday morning the 2016 group had raised more than $57,000. Mitchell was never a victim of pediatric cancer, but he has had his own health challenges. He was diagnosed with Type 1 diabetes when he was 9 years old and has lived with the illness for the past eight years. Type 1 diabetes is most commonly diagnosed in patients from infancy to the late 30s, and is the result of the patient’s pancreas producing little to no insulin. It’s not exactly pediatric cancer but it is juvenile diabetes, and needs to be dealt with on a daily basis. Being given an opportunity to give back to a community is a big deal to Mitchell, and when he’s back home in Orange County he often helps organize walks and fun-runs that benefit the Juvenile Diabetes Research Foundation (JDRF). He said his participation in fund-raising that benefits Rady Children’s reHospital and then visiting the hospital resonates deeply with him. Mitchell is more than satisfied with the way he has upped his level of play since entering his high school years. Living daily with Type 1 diabetes presents its own unique challenges, of course, and Mitchell is proud that he has overcome some pretty long odds to rise to the No. 27 slot in Perfect Game’s class of 2017 national prospect rankings. He considers Oakland Athletics outfielder Sam Fuld his biggest role model in baseball. Fuld, who is sitting out the 2016 season after undergoing shoulder surgery, has played eight big-leagues seasons with Type 1 diabetes and has been an inspiration to the young Mitchell. Mitchell has an insulin pump, which is small, computerized device that delivers insulin through a flexible plastic tube (a catheter) in measured doses; the pump eliminates the need for self-administered shots. He still has to test his blood-sugar levels four or five times a day and needs ready access to sports drinks, water and snacks pretty much at all times. Mitchell has definitely put in the work needed to become a top prospect that Fuld alluded to, and he credits his father, Anthony Mitchell, for much of the progress he’s made. Anthony Mitchell is a physical fitness trainer and has helped his son out not only with running and conditioning but also by working with him in the batting cages. Mitchell played the last two summers with SoCal-based CBA Marucci and head coaches Daylon Monette and Jon Paino; CBA was the top-ranked 17u travel ball team in the country at the conclusion of the 2015 summer and fall seasons. This was a team that last year won the 17u PG WWBA National Championship and the PG/EvoShield Upperclass National Championship, and finished third at the 17u PG World Series. “That was one of my favorite tournaments that I’ve ever played in,” Mitchell said of the 17u PG WWBA championship experience. “It was super-exciting getting to play against all of the big-time guys in PG and it was definitely one of the greatest experiences I’ve ever had playing with one team. Mitchell and Nick Allen were the only 2017s on the CBA roster that won the 2015 17u PG WWBA title, and both are here this weekend. Their 2016 CBA teammates Tyler Freeman, Jeremiah Estrada and Ben Ramirez will also suit up for the Classic’s West Team on Sunday. It is worth noting that he’s shaved nearly a half-second off this 60-yard dash time in the last two years, dropping it from the 6.8-second range down to 6.35-seconds at the PG National Showcase held in Fort Myers, Fla., in mid-June. Mitchell enjoys showing off his tools on PG’s biggest stages and he really likes it when hundreds of sets of some really important eyes are analyzing his every move. He fit in very well at the PG National, and it was his performance at that prestigious event that led to being invited to the PG All-American Classic. The same can be said for just about every other 2016 PG All-American, with the exception of only a handful. “It was so much fun; it was good being out there and playing with some of the best guys from around the country,” Mitchell said of the PG National experience. “Just being able to show off my skills with running, hitting and throwing, that was just a lot of fun. The 17-year-old Mitchell – he’ll turn 18 early in September – has committed to UCLA, which he said has been his “dream school” ever since he was a youngster. It’s quite possible, of course, that he’ll never make it to Westwood, depending on how major league front officer personnel and scouting departments view him after he completes his senior baseball season in the spring of 2017. Depending on when his name gets called, he could very well follow Fuld in the big leagues, proving to one and all the Type 1 diabetes can be effectively controlled if not completely conquered. Mitchell has been fortunate in that he, with the help of his doctors and parents, have been able to effectively manage his diabetes to the point where he has done very little hospital time. 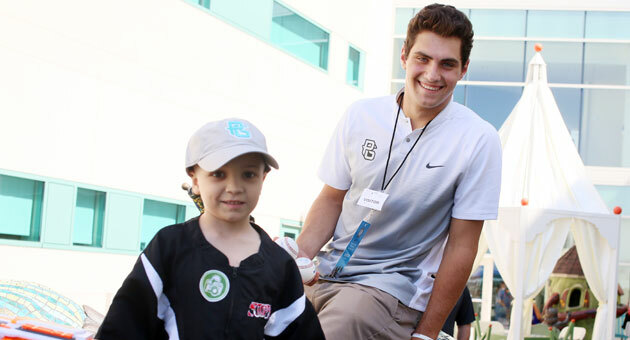 But it was a hospital – Rady Children’s Hospital – that was forefront on his mind Friday morning. He was able to forget that the Rady visit would be followed by a trip to the beach house owned by PG All-American Classic Honorary Chairman and future MLB Hall-of-Famer Trevor Hoffman, where he could surf, swim and play beach volleyball. Friday night would offer team practice sessions and an always competitive East vs. West game scrimmage. “Just being able to talk to (these young patients) just makes me really grateful for what I have,” Mitchell said just before the Rady visit was complete. “I’ve been blessed with the opportunities I've been given, so to be able hang out with (one young patient) who has so much life and so much excitement inside of him even though he’s (very ill), it’s very eye-opening.